Extravert or Introvert – where do we get Energy: What energizes me most-Interacting with other people or being by myself? Sensor or Intuitive – how people perceive : The Forest or the Trees? Do I usually pay more attention to the facts and details or do I try to understand the connections, underlying meaning, and implications? Thinker or feeler – How people make Decision –- Do I make decisions more objectively, weighing the pros and cons, or based on how I feel about the issue, and how I and others will be affected by it? Judger or Perceiver – describes the very different ways people like to organize their world, and how they like to live their lives: Do I tend to make most decisions quickly and easily or does making decisions often make me anxious and unsure? Would I rather have things settled and decided or be able to leave my options open, just in case something unexpected comes up? These 4 dimensions are all very good descriptors of personality type, and are all important in understanding people. Of course, the combination of these 4 types results in 16 different variations. Whereas an expert is able to master the nuances, for regular Joe, it’s a bit overwhelming. 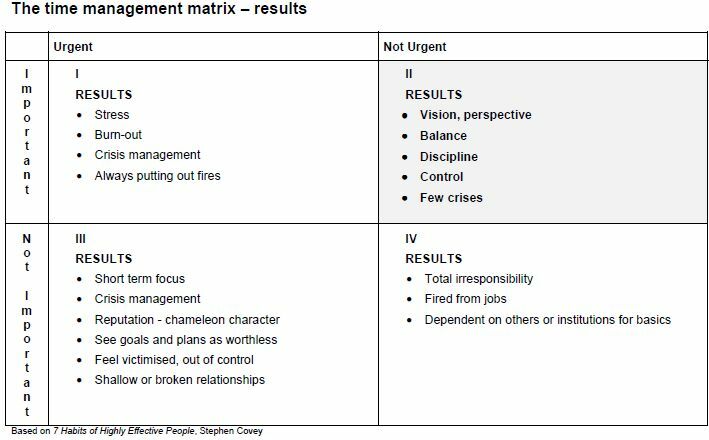 If we ignore the Sensor/Intuitive and Judger/perceiver type ( for both of these are related to our decision making process), and roll them into thinker and feeler, we have a 2 by 2 matrix for personality quadrants. Before looking more closely at each of the four basic personality styles, it’s important to note that what follows are generalized, simplified descriptions of behaviors and attributes. It’s best to view the descriptions of the different personality styles as a sort of “shorthand” that provides useful, but incomplete, information about any individual. Human beings are extraordinarily complex, and no one is exclusively one temperament or type. While everyone is likely to have a dominant type or style, that style is augmented by a mixture of the other types and their traits and is often dependent on environment and circumstance. Also, no one personality style is “best”; each can be successful, and each has its merits as well as its drawbacks. The Analytical personality falls in the quadrant formed by the boundaries of Introvert/Thinker. 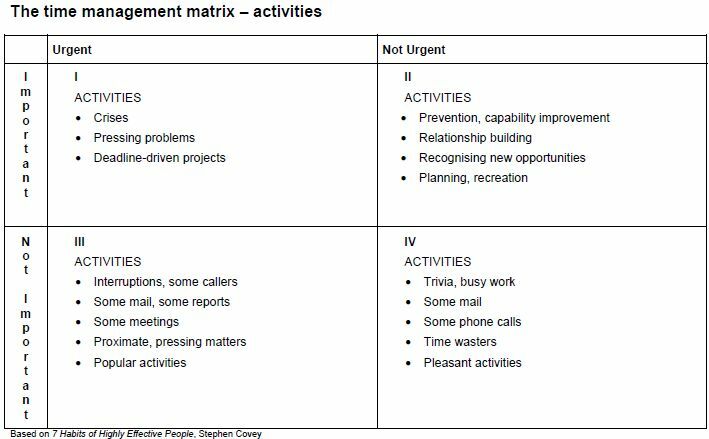 Individuals in this quadrant are generally described as being logical, thorough, serious, systematic, prudent, cautious, and compliant. This personality type emphasizes working conscientiously to ensure quality and accuracy. Analytical personalities tend to focus on tasks, seek details and facts, and need structure. Positive descriptors include perfectionist, questioning, idealistic, sensitive, self-disciplined, and precise. Negative descriptors or weaknesses include moody, negative, critical, rigid, legalistic, touchy, self-centered, unsociable, and impractical. Examples of the Analytical personality type include Thomas Jefferson and Albert Einstein. The amiable personality falls in the quadrant formed by the boundaries of introvert/Feeler. Individuals in this quadrant are generally described as being steadfast, cooperative, supportive, diplomatic, patient, and loyal. This personality type emphasizes cooperating with others to carry out a task. Amiable personalities tend to focus on people, seek sincere appreciation, and need time. Positive descriptors or strengths include organized, easygoing, likeable, empathetic, dependable, and practical. Negative descriptors or weaknesses include stubborn, indolent, unmotivated, self-protective, plodding, and dependent. Examples of the amiable personality type include Robert E. Lee and Dwight D. Eisenhower. 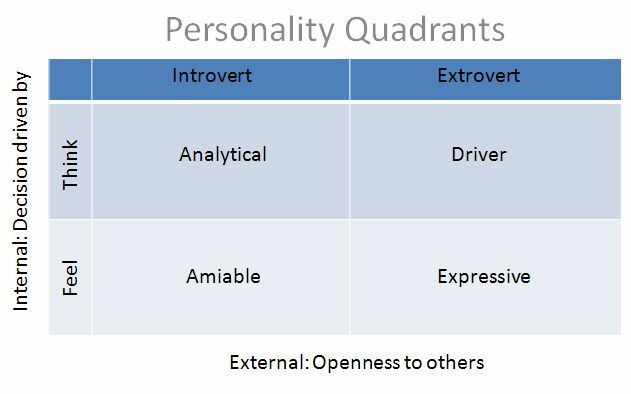 The Driver personality falls in the quadrant formed by the boundaries of Extrovert/thinker. Individuals in this quadrant are generally described as being dominant, independent, candid, decisive, pragmatic, and efficient. This personality type emphasizes overcoming opposition to accomplish results. Driver personalities tend to focus on tasks, seek power and control, and need challenges. Positive descriptors or strengths include determined, strong-willed competitive, decisive, demanding, visionary, and optimistic. Negative descriptors or weaknesses include domineering, controlling, insensitive, inconsiderate, unsympathetic, hostile, overbearing, opinionated, and unforgiving. Examples of the driver personality type include Henry Ford I and Charles Lindbergh. The Expressive personality falls in the quadrant formed by the boundaries of Extrovert/Feeler. Individuals in this quadrant are generally described as being charming, outgoing, enthusiastic, persuasive, fun-loving, and spontaneous. This personality type emphasizes influencing or persuading others. Expressive personalities tend to focus on people, seek popularity and recognition, and need to spotlight. Positive descriptors or strengths include warm, friendly, responsive, compassionate, and generous. Negative descriptors or weaknesses include undisciplined, disorganized, unproductive, dramatic, hasty, and manipulative. Examples of the expressive personality type include Winston Churchill and Franklin Roosevelt. It’s helpful to learn how to recognize the basic personality styles so you can better interact with others. Keep in mind, however, that these are generalities and simplifications. One size does not fit all. The office of the Analytical personality will often be very formal and neat, with lots of reference books and certificates/awards on the wall/desk. When communicating, the Analytical tends to be very formal, avoid physical contact, lack facial expressions, have minimal eye contact or gestures, and have long pauses in conversation. You should be aware of the fact that interactions with this personality type may be difficult. The Analytical personality tends to focus on minor details an may not consider other’s feelings; their questions may seem critical and insensitive to others. When working with an Analytical, you should be prepared and thorough; don’t be flippant on issues. You should try not to ask for quick decisions to be made, but rather allow time to discuss details. The office of the Amiable personality will often have a warm and comfortable feel, with photographs of family and friends, plants, personal items, and piles of papers present. When communicating, the Amiable tends to be relaxed, use a calm and quite tone, have a relaxed posture, make eye and possibly minor physical contact, and listen before responding in conversation. You should be aware of the fact that this personality type tends to like routine and may be slow to adapt to new situations. The amiable personality tends to avoid rejection, take difficulties personally, and may become stubborn if pushed to make a decision. When working with amiables, you should try to be patient and supportive and ask for their opinions; don’t “Spring Surprises” on them. The office of the Driver personality will often have a “sterile” appearance, with minimal wall decorations, a neat and well-organized desk, and a personal organizer. When communicating, the Driver tends to be direct, use emphatic language, and have an authoritative handshake. Drivers tend to lean forward and make eye contact and are often quick to show impatience. You should be aware of the fact that Drivers can appear arrogant, tend to push too hard, and may be poor listeners who don’t absorb feedback. When working with a Driver, you should try to be brief, direct, assertive, and confident. Focus on objectives and results and avoid unnecessary details. The office of the Expressive personality will often have a messy desk, lots of pictures/decorations that may not be work-related, and sticky notes piled around the phone. When communicating, the Expressive tends to have a relaxed posture, use lots of gestures, make eye and physical contact, employ a lively tone with pitch changes, and fill silences. You should be aware of the fact that expressive may lack focus and may be too casual at times. They can lose interest easily and be poor at planning and follow-up. When working with an Expressive, you should try to be friendly, open, and flexible. You might want to engage in small talk, and try not to express pessimism or bore them with details. “Flexing your style” refers to doing what is appropriate in a communication situation by temporarily using some behaviors typical of your non-dominant styles. It doesn’t mean abandoning your dominant style, but it does require that you be well aware of your style’s strengths and especially your own and other’s weaknesses. It requires using body language and matching your wording to the preference of the person you are communicating with. Learning to flex your style is especially important when the other person is stressed, something important is at stake, or you need to get off on the “right foot” in a new setting. You ability to adapt or bring into play different style traits in response to different situations and needs is one of the most powerful capabilities that anyone can possess.